Two of the most successful young artists in the field of Country Music who have achieved lasting stardom in recent years are Wynn Stewart and Jan Howard. Both Wynn and Jan started their recording careers on the West Coast. In recent years, more and more Country Music stars have been coming from our Western states, notably California, including Buck Owens, Merle Haggard, Glen Campbell and others. Most of these wonderful people "went west" after being born or reared in our Southern states. 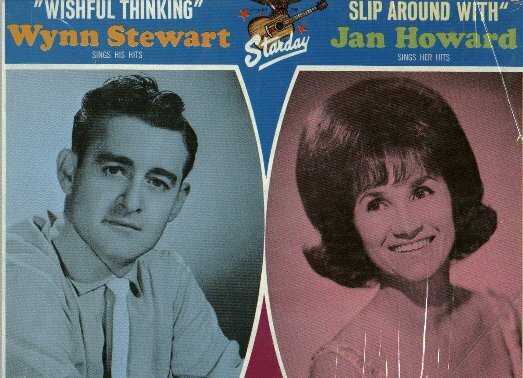 But it is significant that they were able to create great Country Music songs and recordings using West Coast facilities, and we believe Wynn Stewart and Jan Howard are outstanding exponents of the West Coast's Country Music sound. The recordings in this album by Wynn Stewart and Jan Howard represent some of their greatest work and were originally issued on the Challenge label. Wynn's tremendous hit recording of "It's Such a Pretty World Today" has brought him to international stardom and Wynn Stewart fans will greatly appreciate being able to add this great album to their collections. As most Country fans are aware, Jan Howard was, until recently, the wife of the famous songwriter, Harlan Howard. In fact, all of the songs that Jan sings in this wonderful album were composed by the great Harlan Howard, which is assurance of outstanding Country song material. Jan Howard is now a Grand Old Opry star in Nashville, Tennessee. She is a marvelous stage entertainer and outstanding Country singer, and, in addition, she is a beautiful and charming person. She has had a long string of record hits on her own in the last couple of years and she has also scored with Bill Anderson on the smash "For Loving Me". Therefore, we think Jan Howard fans will particularly appreciate the fine collection of recordings in this album. Starday is proud to see Country Music originate from all corners of our Country, and we will continue to assemble truly worthwhile material for album issues such as this one.